This month a morning with no rain seems like a remarkable thing so, when it wasn’t tipping down this morning I figured I’d best get outside and make the most of it. 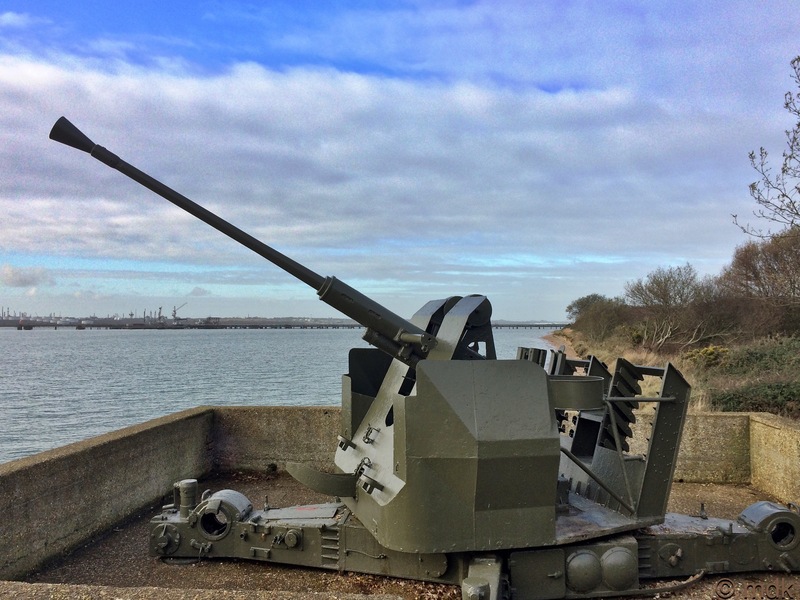 A few days ago I’d been telling CJ about the Bofors gun on the shore at Hamble so I thought it might be fun to take him down there to see it. 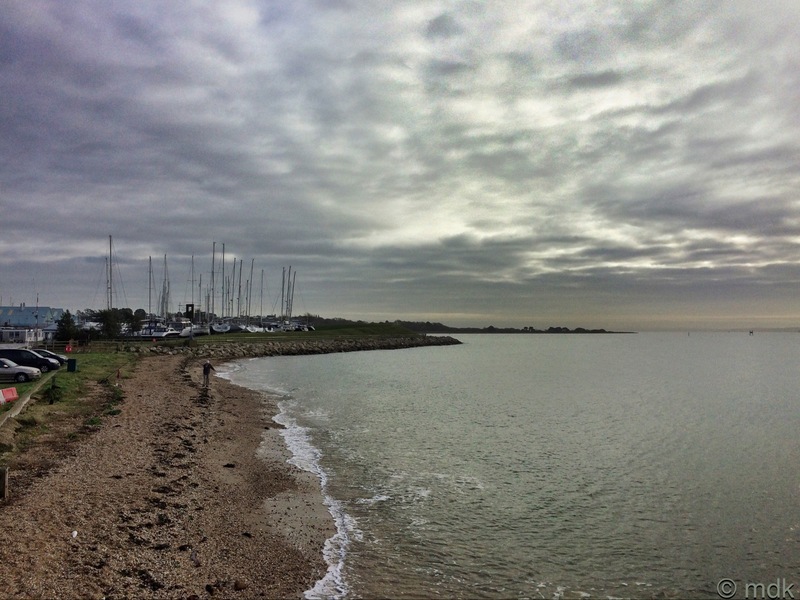 Maybe we could have a little wander on Hamble Common too if it wasn’t too muddy. 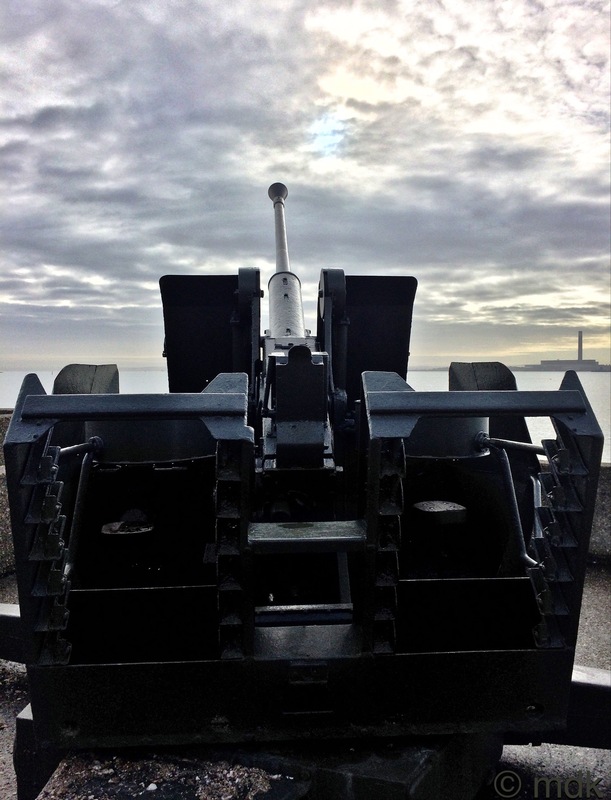 There’s a car park on the shore right next to the gun and, when we got there, it was almost empty. Obviously most people are too sensible to go walking along the shore on a blustery cold day. At least it meant we had the gun all to ourselves. 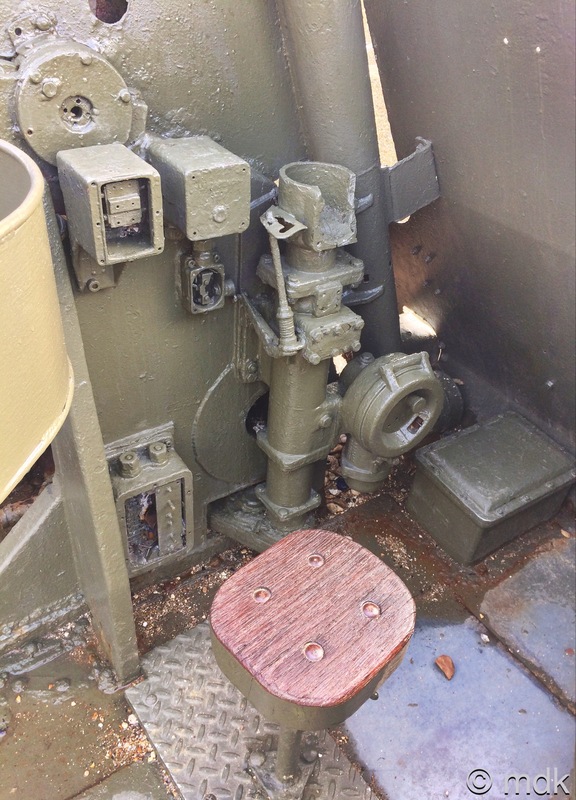 While I was still changing from driving shoes to walking boots CJ was already climbing up onto the gun emplacement. When I got there he had a big grin on his face. 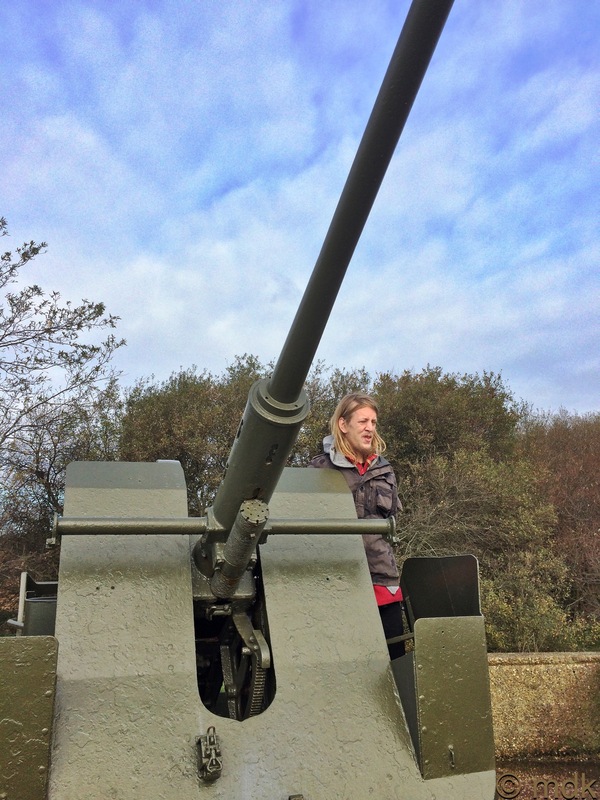 “I wonder if it shot down any German planes?” CJ mused. CJ was surprised how small and cramped the gunners seats were, even for someone as slim as him. “They don’t look all that comfortable either,” I said. “Maybe they brought cushions,” he suggested. “Maybe you should learn to fly a plane next then Mum,” he said with a cheeky grin. 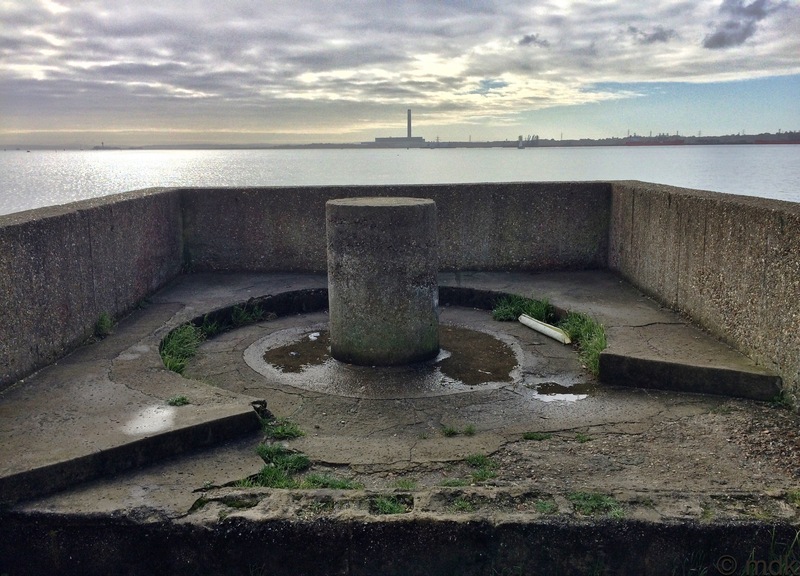 So we poked about on the gun emplacement for a while looked out over the spires and towers of Fawley across the water trying to imagine what it must have been like sitting there watching for enemy planes. It was windy and cold so, after a bit, it seemed like a good idea to get moving and warm up. 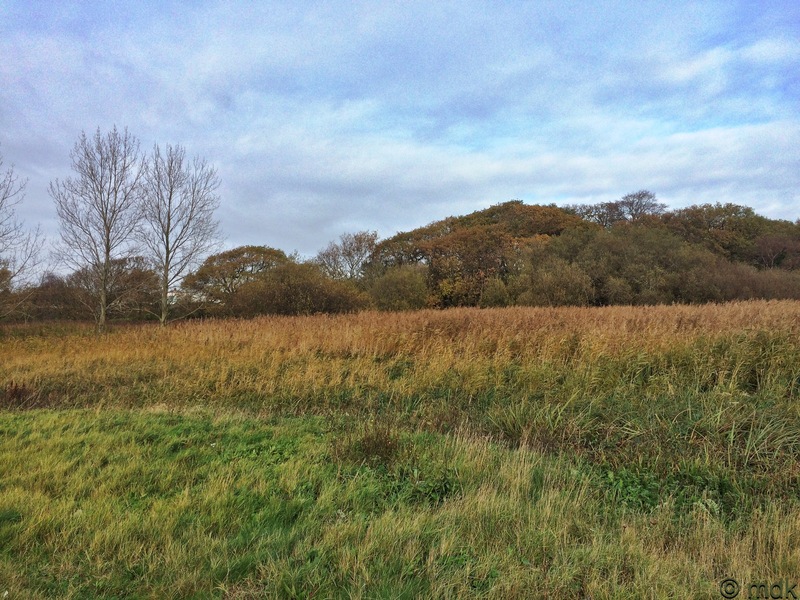 A cursory glance at the trails leading up into Hamble Common showed it would be madness to even think about tramping through the mud. Commando would not be a happy bunny if I brought the car back filled with mud and I didn’t fancy falling over. 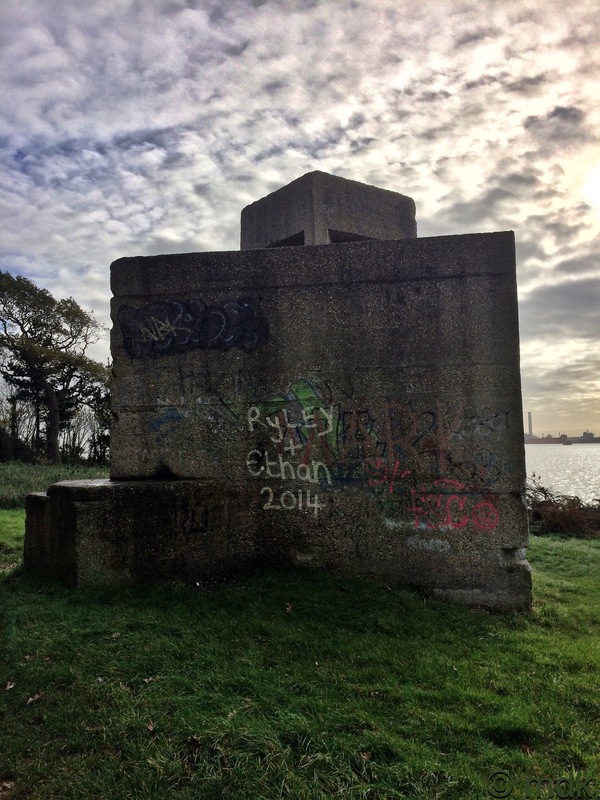 “There’s a pill box along the shore. I can’t really remember how far it is but we could go and have a look if you like?” I suggested. 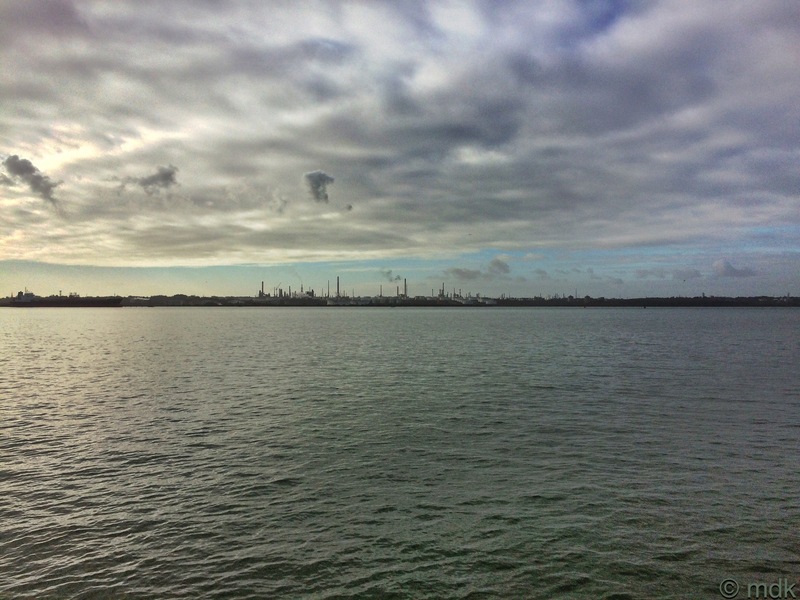 CJ thought it was a good idea, which was a good job because there really wasn’t much of an alternative, so we set off along the narrow track in the general direction of Netley. While we walked I wittered on about the cygnets I’d seen on the estuary last time I came this way and CJ pretended to be interested. Then we reached the walkway under the oil pipeline. This was much more CJ’s kind of thing and I stood around while he took photos. “I suppose the gun was protecting this too,” he said. Of course CJ knew all about the Pipe Line Under The Ocean. 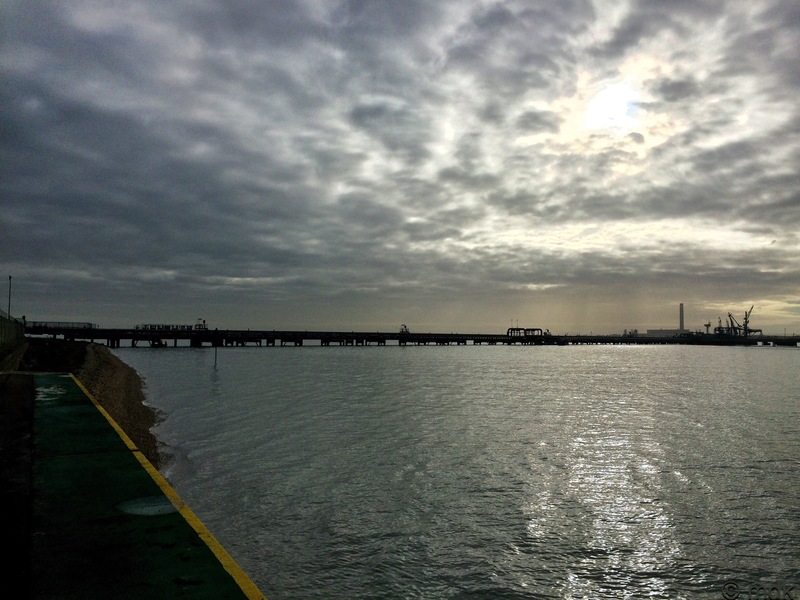 On the other side of the oil terminal there was no path so we had to walk along the shingle. This is a great deal harder than it looks because your feet sink down into the stones with every step. 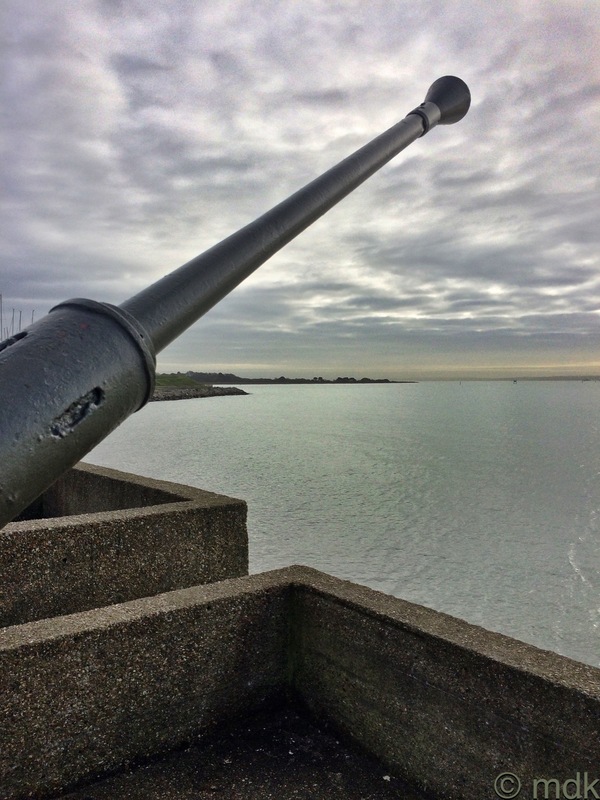 Earlier, standing on the gun emplacement, we’d been cold, now we were both getting much warmer than we’d have liked. To take our minds off the hard work I told CJ a story I’d heard about the oil terminal and the war. Soon we passed the place where I came face to face with a deer last time I came this way. We both stopped for a moment and peered intently into the long grass but neither of us saw anything. Maybe there were deer in there watching us though. 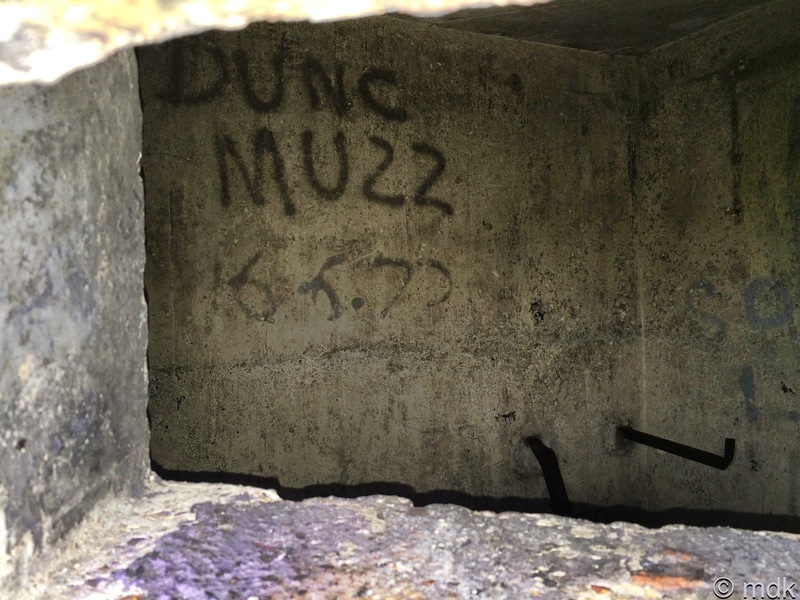 Not long after this we saw the pillbox. 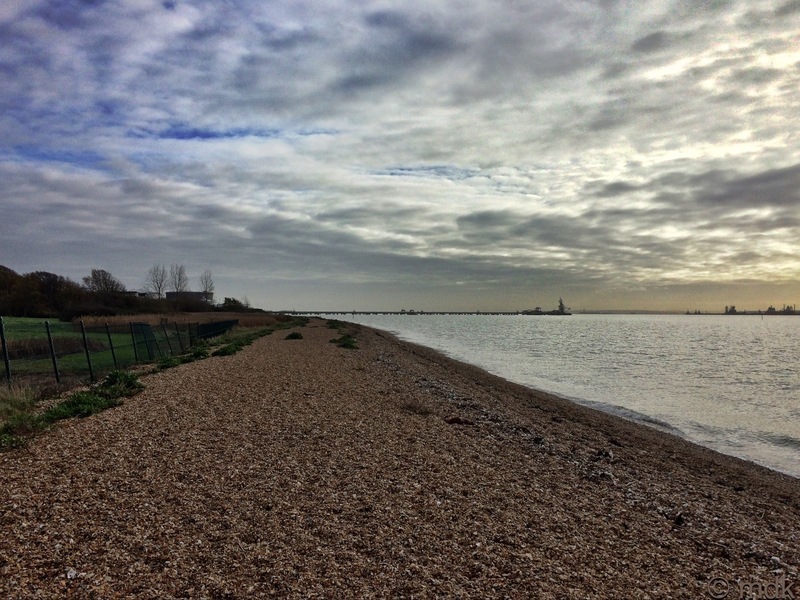 It was a relief to get off the shingle and onto the narrow grass track leading away from the shore. “It reminds me of walking through the woods at L’Anse Du Brick,” CJ said as we climbed. “You can’t get inside this one though,” I told him. Of course, when we got there he had to try but, even climbing up onto the raised platform where the entrance was before it was bricked up, it was obvious he’d never make it. Disappointed, he got down and walked around the outside peering into the small hole in the side. 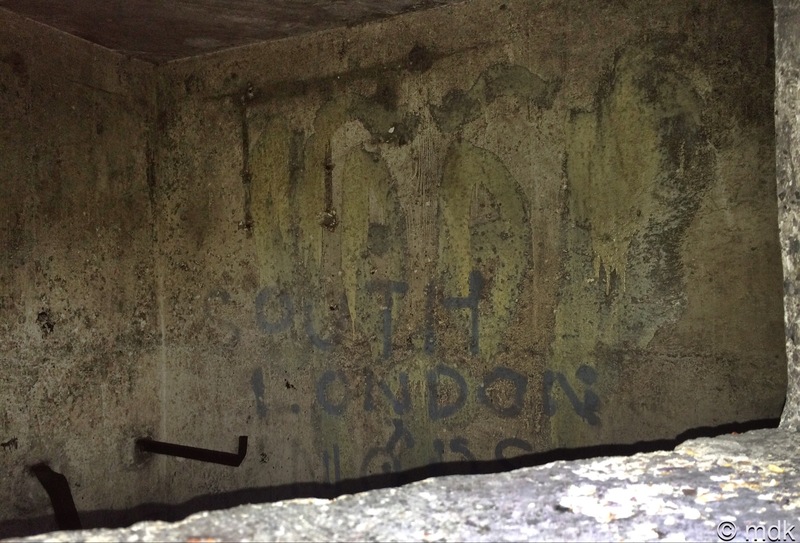 “There’s graffiti in there from 1972,” he said excitedly. So I crouched down and did the same. 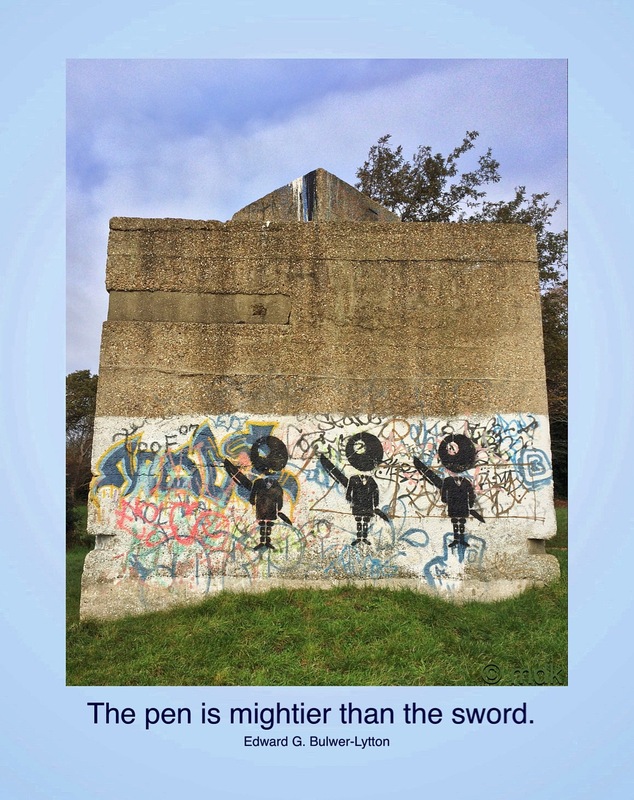 He was right, there was graffiti inside and some of it was dated. 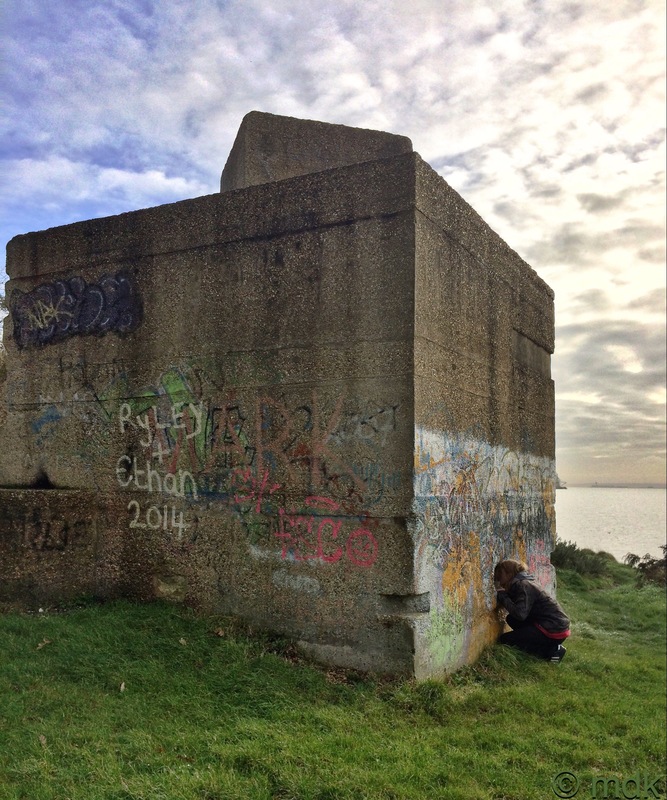 As we walked around looking at the graffiti on the outside walls I told CJ about the pillbox I’d seen in Gosport. Behind the pillbox a narrow trail disappeared off into the woods. 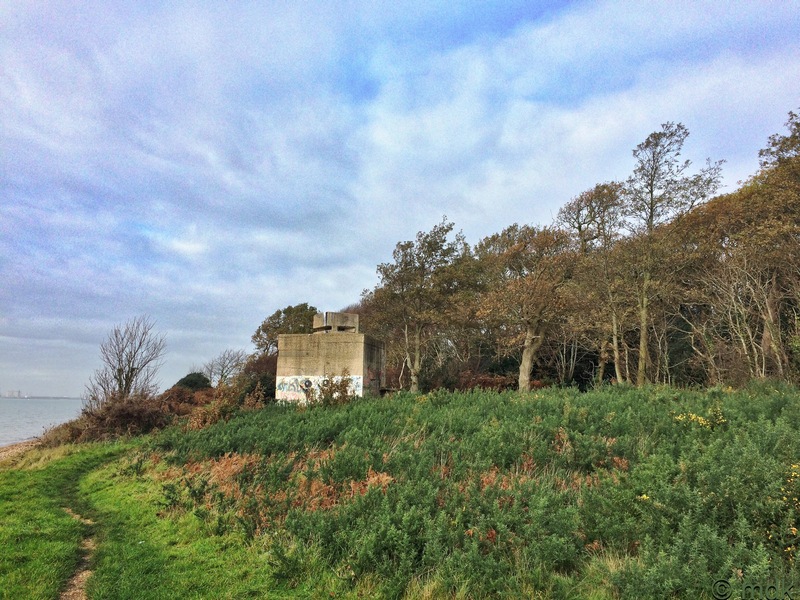 It seemed drier than the trails we’d seen leading into Hamble Common and we thought there might be a way back to the Bofors Gun at Hamble Point that didn’t involve tramping across the shingle so we went off to explore. 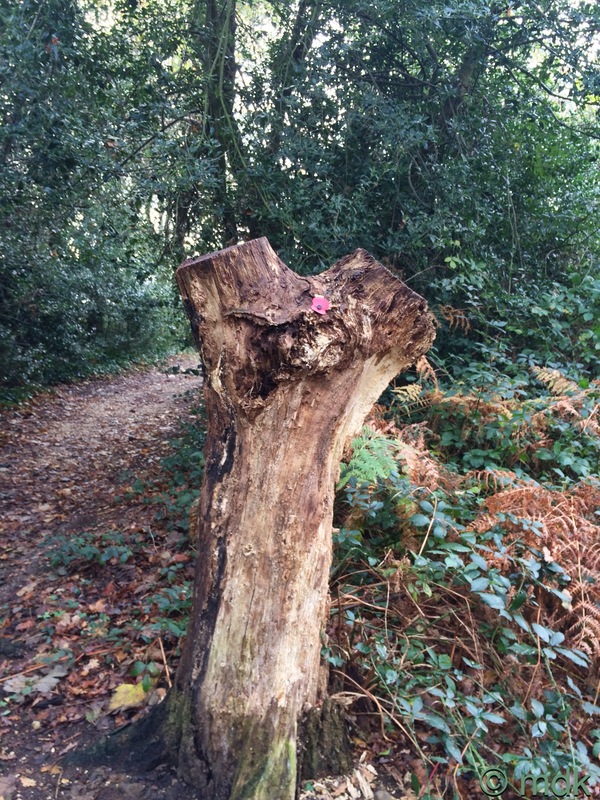 A little way along we came to a Y shaped tree stump. 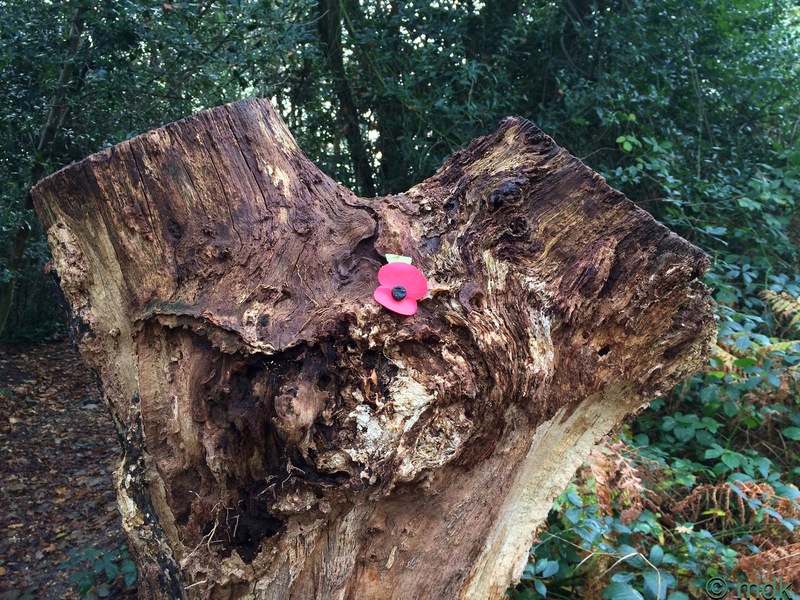 Someone had stuck a poppy between the two sawn off branches. “I wonder what that’s about?” CJ mused. In the end the trail led back to the road, as I’d thought it probably would. We could have made our way back that way but it would have meant walking a lot further and would have taken us along the long winding road we’d driven down to the shore. That road had no footpath for the most part so we both agreed it was a bad idea and there was nothing for it but to struggle back across the shingle. All in all it hadn’t been a very long walk, less then two and a half miles, but the work of crossing the shingle made it seem longer but we’d had an interesting morning. Exploring the Common would have to wait for another, drier, day. Interesting as are all your walks. I’d love to be able to get inside and have a look around. We went in lots of them in Normandy. Mostly they seem to be used as drinking and smoking spots for French teenagers nowadays. Walking on shingle certainly is hard work. I’m very glad that we’ve never had to build pillboxes on these shores. Or maybe we did and I’ve never heard of them. That gun is certainly an unusual sight I would think. 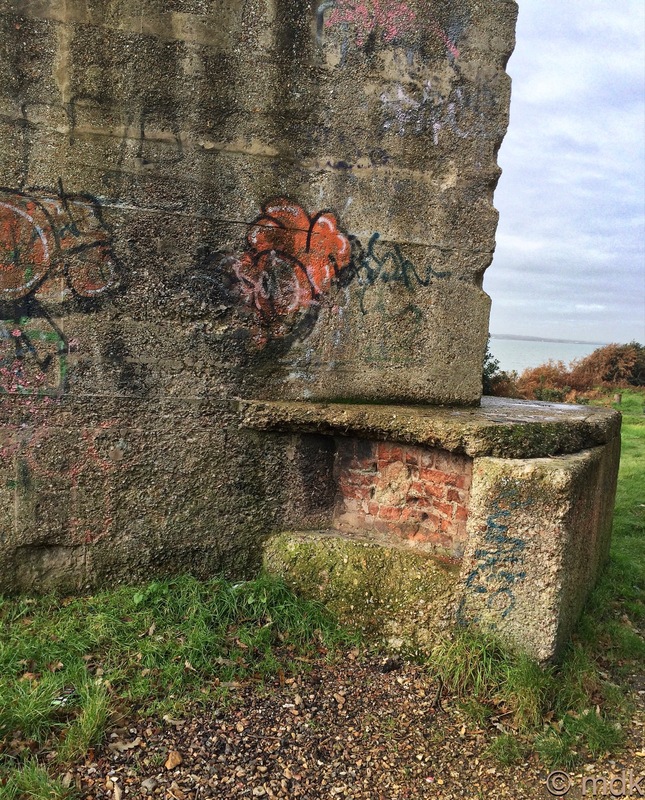 There are lots of pillboxes still hidden along the English and French coast but I don’t think there were any built in the US. The gun is an unusual thing. I don’t think there are many of those still around. We haven’t had too many blue sky days this month.